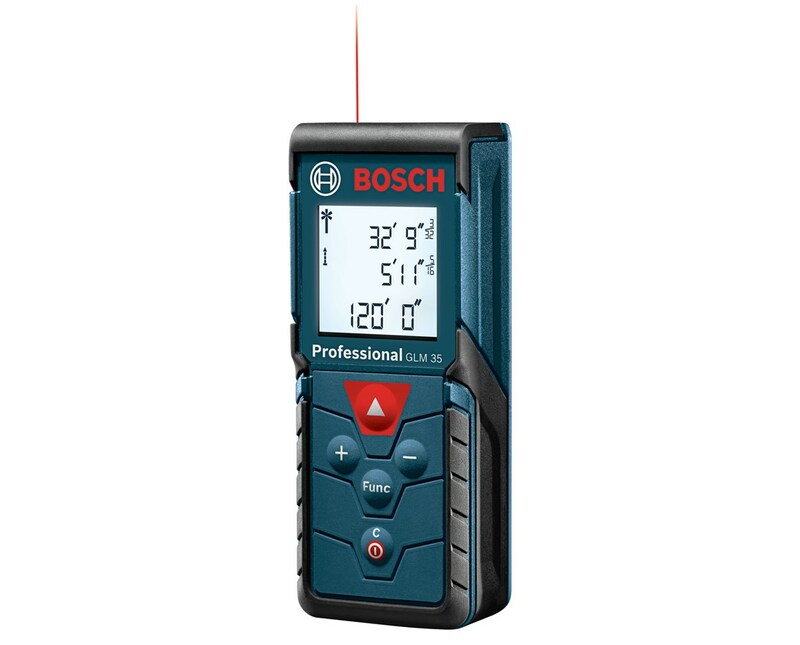 The Bosch GLM 35 120' Laser Measure is a handy multi-purpose laser measuring tool. 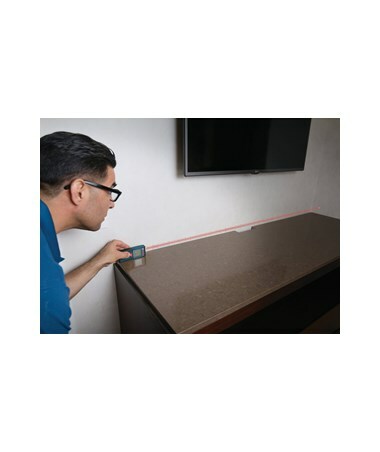 With this laser meter, you can measure area, distance, length, volume. You can add and subtract measurements. To use the real-time measurement function, you first need to turn it on by selecting that measurement mode on the display. The laser will start updating measurements every 0.5 seconds. Then you just move your GLM 35 until the desired position is reached. 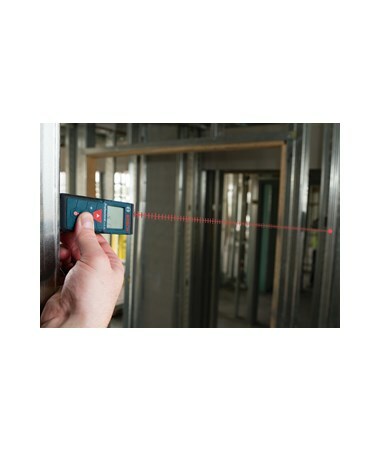 You can also use this laser tape measure for indirect distance measurements. 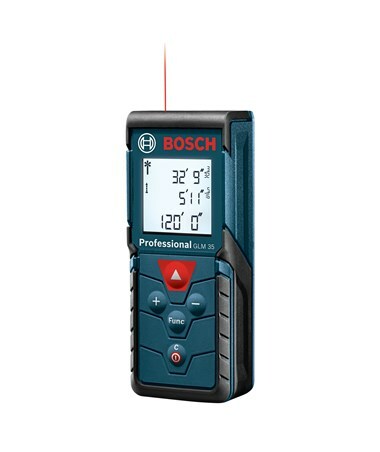 This laser distance meter has a measuring range of 6” - 120' (0.15 - 35 m) with an accuracy of ±1/16" (± 1.5 mm). Tedious and time-consuming two-person measurement jobs can now be done by one person in a fraction of the time! The GLM 35 takes measurements in precise 1/32” (1 mm) graduations. The backlit LCD display is easy to read and the intuitive keyboard is quickly mastered. This pocket-sized distance laser is 4.1"L x 1.6"W x 0.9"H, and weighs less than a quarter of a pound (0.22 lb). It uses 2 “AAA” batteries (included), that give you about 4 hours of operating time. An automatic shut-off feature helps extend battery life. The laser will shut off after 20 seconds of non-use. The measuring tool itself with shut off after 5 minutes without a button being pressed. 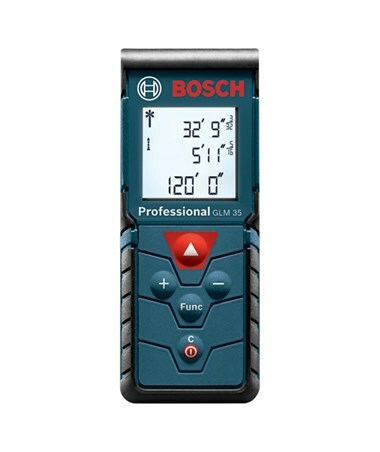 The Bosch GLM 35 laser distance meter comes with a 1-year limited manufacturer's warranty. If you register your unit within 8 weeks of purchase, you can take advantage of the 2-year extended warranty period.